The Bold and the Beautiful spoilers tease that Katie Forrester (Heather Tom) will be on the receiving end of some shocking news. She’ll get ready for a romantic Valentine’s Day with her husband Thorne Forrester (Ingo Rademacher), and she’ll pull out all the stops. She’ll see to it that they have a nice, private evening together so they can celebrate their love. But B&B spoilers say that Thorne will have another idea in mind. He’ll have some major news to drop on Katie, and it won’t be good. Thorne has been really struggling lately with Katie’s newfound relationship with Bill Spencer (Don Diamont). Bill’s really stepped up to the plate and been a much better father to Will Spencer (Finnegan George) in recent weeks, and Katie has noticed. Katie’s even invited Bill over for dinner, and Thorne’s been subjected to watching Katie, Will, and Bill bond as a family unit. He’s been feeling like the odd man out, and he may be re-evaluating his marriage to Katie. Remember, when Thorne and Katie got together, Bill wasn’t in the picture, so things have really changed. But what exactly is this news that Thorne is going to drop on Katie? Well, it’s a terrible thought, but he could just come out and tell Katie that it’s not working and that he wants a divorce. This would really shock Katie and would be the most drastic move that Thorne could make. Or, perhaps Thorne will decide that he simply needs some time away to evaluate all of the recent changes in their lives. He could go away for a while, perhaps overseas, to clear his head and think about what he really wants. That news would rock Katie, too. Whatever Thorne’s announcement is, B&B spoilers hint that Katie will be quite upset. She’ll even turn to her ex Wyatt Spencer (Darin Brooks) for comfort and counsel after Thorne drops his bombshell. It must be a serious relationship problem if Katie’s going to reach out to Wyatt for advice. At any rate, Valentine’s Day is not going to end up being the intimate, romantic celebration that Katie thinks it will be. Rather, it sounds like it may be a sad day. What do you think Thorne’s going to tell Katie? 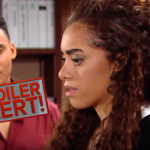 General Hospital Spoilers: Oscar Nero Death Confirmed, Garren Stitt Out!